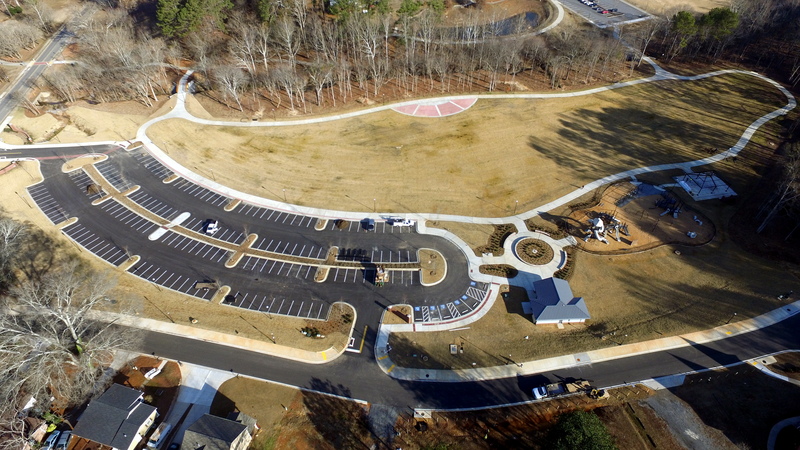 The main entrance of Logan Farm Park is a newly developed section located off Cherokee Street, directly across from what was formally known as Tanyard Creek Park. This section of the park contains walking trails, a pavilion available for rentals, restrooms, and a large destination playground. This entrance is located only a short distance from the historic downtown shopping district and restaurants. This entrance is home to the Parks and Recreation Administrative Offices. This section of the park also contains a lighted one-third mile walking track around a multipurpose recreational field, a half-acre fishing pond, a playground, and public restrooms. The trail connects to what was formerly known as Terrace Drive Park, a neighborhood park that provides residents with a mixture of active and passive recreational opportunities. Terrace Drive contains a playground, picnic pavilion, walking trail, basketball goal, and a small open field. Parking for this section of the park is available on School Street. This section includes what was formally known as Tanyard Creek Park, as well as the Amos Durr Community Field. Tanyard contains a walking trail connecting Cherokee Street, School Street and McClain Circle. Durr Field is primarly used by the Acworth Baseball Association but can be used on a first-come, first-serve basis if it is available.